This is never an easy thing to do, ask for money or even ask for help. Another thing that is not easy is to hear, "your Mom has cancer". I know some of you may know and others may not. 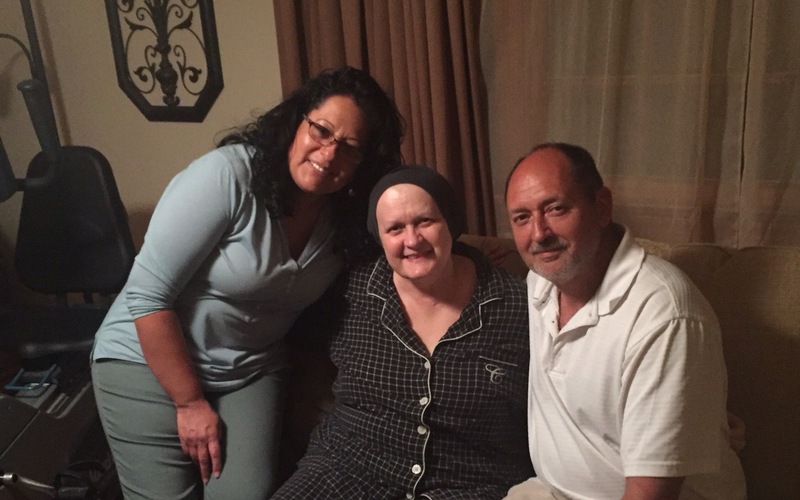 My mother, Debra Edwards was diagnosed with Ovarian Cancer on January 8, 2018. After trying to get a diagnosis for well over a year, we finally had one. My Mom has been suffering from severe back pain and cramping for about two years. At first she suffered through it as she didn't have medical insurance. She was trying whatever homeopathic solution she could find to get her to the 2017 open enrollment window for the ACA. In 2017 we got her an appointment with any specialist we could get her in with. Starting with an OBGYN, to an Orthopedic, then a Urologist, and another OBGYN, two Emergency room visits. Countless tests; CT Scans, Sonograms (internal and external), x-rays, MRIs, blood work - NO DIAGNOSES. Open enrollment for 2018 comes around and she receives a letter that her insurance company is leaving the ACA Marketplace. We do research to find out the only option is a $700/ mo premium with a $7500 deductible. Feeling defeated she made the decision to go through 2018 without insurance. Finally mid-December, the Urologist sees a cyst in a scan that appears to be on her ovary and pressing on her kidney. He does his job, tells us her back pain is likely being caused by the cyst pushing on her kidneys. This also has now caused her kidneys to not function properly, so she now needs a stent. He was amazing and made sure he could get her in for surgery before she ran out of insurance. December 21, 2017 they put in the stent. We were hoping the stent would help relieve some pain for her. We knew we would have to take care of the cyst and it would probably be out of pocket in 2018. Well... January 2, 2018 she texts me that she is in terrible pain and something didn't feel quite right. The nurse at the new OBGYN office suggested we get her to the hospital and that her doctor just happened to be on site all day. Within an hour of being at the Hospital we find out she has multiple blood clots in her leg, probably from having the stent put in. They start her on blood thinners and give her medicine to help with the pain. She spent 3 days in the hospital this time around and her OBGYN came in for a consultation where he told her that he wanted her to see someone more equipped to deal with her cyst. So she was referred to an OBGYN Oncologist in Richmond. From here everything has moved in a weird daze of fast forward and slow motion virtual reality. January 8, 2018 - My parents spent 8 hours in Richmond meeting the new doctor, having blood work and more scans done, and then the consultation that told them that my Mom has Ovarian Cancer. Normally when you are diagnosed with Ovarian Cancer the first defense is to operate, remove the cancer or as much as they can. Well since my Mom is on blood thinners for the blood clots, surgery right now isn't an option. Our first line of defense is Chemotherapy. January 12th she had a port implanted in her chest and on January 17th she had her first Chemo infusion. Chemotherapy is scheduled to take place every 21 days. The hope is that we can keep the cancer from spreading until she is able to be off blood thinners and have the tumor removed. This cyst that we thought was going to be a little surgery to take care of is now a tumor the size of a grapefruit. So now the battle begins! There is nothing easy about this as most of you have known someone that has fought this fight. 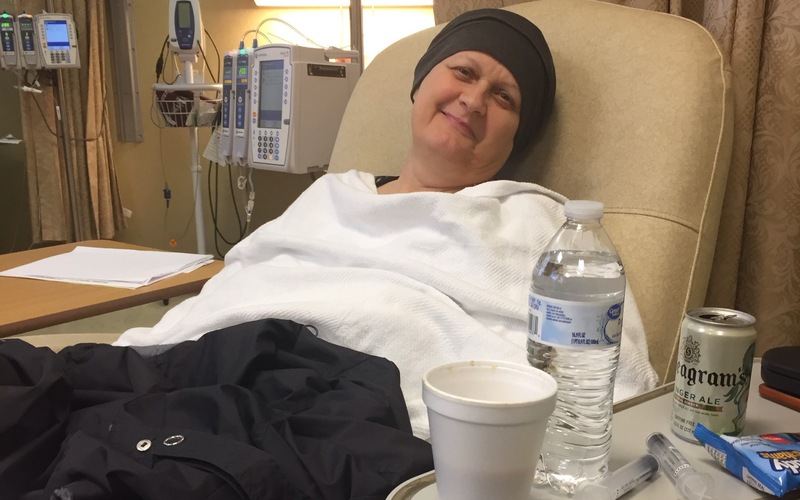 I wanted to start this fundraiser of course to get financial assistance for my Mom, but also I wanted to be able to document her journey and share it with our loved ones. I can't reach out to each and every one of you to update you on how she is doing so this is where I will give medical updates and just let you know she is still fighting and that we all appreciate the love and support we have already begun to receive. The money received will go directly to the medical bills that have already started to pile up. No one should have to worry about money when they are fighting for their lives. On behalf of my Mom and my family, THANK YOU! Thank you so much to everyone that has donated money towards my Mom’s medical bills. I can’t express the gratitude my entire family feels for each one of you. Thank you also to everyone that has reached out to not only provide support directly to my Mom, but thank you to everyone that has reached out to my sister and I to see how we are doing and to check on Mom. I am sorry that I am just now updating you on Mom’s progress with treatment. As you can imagine we have all been busy going from appointment to appointment and just trying to get through the day to day. Her first chemo treatment took 10 hours because she still had a lot of swelling around the port. She had to get a CT scan to make sure everything was good so the chemo nurse could get the go ahead to proceed. All my Mom’s nurses and doctors are wonderful - super sweet, patient, and caring. They all really take their time with my entire family to make everyone feel comfortable. They would like her to get genetic testing done to see if she has BRCA1 or BRCA2 gene changes. This would tell us girls if we need to be tested. But the testing is expensive without insurance so I am going to see if my doctor will just go ahead and test me. Her doctor is also going to check to see if he can work something out with the lab to cover the costs. We shall see. Her second chemo went very well, no problems at all. She did have to get the neulasta onpro shot attached to the back of her left arm after her second chemo. It is a patch that is able to inject her with medicine at a specific time after Chemo. It gives her a warning beep and then does the shot by itself. Then she can remove the patch and throw it out. SO COOL! It raises your white blood cells, fights against infection and rebuilds bone marrow. Side effects from the shot were minimal, bone pain and headaches for about 3-4 days. All in all she is doing well and we are all amazed that she has barely had any nausea and no vomiting. So thankful they seem to have the anti-nausea meds figured out. 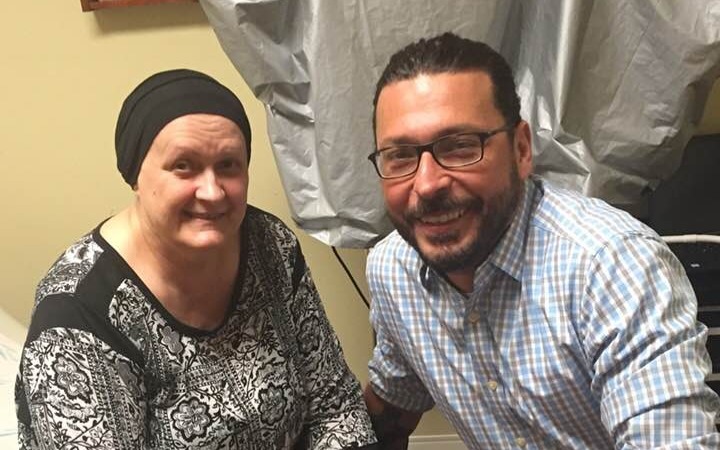 Her next chemo treatment was today at 9am. They had some trouble again with the port, but they had it figured out much quicker this time. We met with her doctor on Tuesday and are so happy to hear the chemo appears to be working, her CA125 (tumor marker test) has gone down to about 160 from way over 400! Her next CT scan is scheduled for March 16th, we are looking forward to seeing the comparison scans in hopes of finally being able to schedule her for surgery. She meets with a Hematologist on Friday to see how her blood clots in her leg are doing. This and the scan will determine if we are looking at surgery soon or after another three chemo treatments. be one of the sweetest people on the planet, but she is a fighter! We have all seen it these last few months. Her attitude has remained so positive, which I definitely attribute to the fact that her body is responding to treatment. So please keep her in your thoughts and prayers, and keep sending those positive vibes. Please feel free to share this update and any continued monetary support is appreciated as these bills keep coming! Your kindness and generosity is thought of often. We hope to have even better news next month. Stay tuned~ Peace and Love to all! So on March 16 I finally had my follow up CT scan to check my chemos progress. It didn’t appear any smaller but my oncologist said it looked less angry. Having the DVT in my left leg slowed down my hope of a quick surgery. Both my oncologist and hematologist agreed on the timeline of 3 months of blood thinners and 3 rounds of carboplatin/ taxol chemo infusions before surgery. Finally after the 3 months of back pain, leg pain, headaches, bone pain, dizziness, blurry vision, racing heart, crazy foot pain and a scary, bouts of IBS and a really scary vertigo episode my surgery is scheduled for Monday, April 9th. I will be having an open abdominal hysterectomy to remove the melon size cyst, Fallopian tubes, uterus and anything else that may be showing tumor growth. I was hoping for the easier option of laparoscopic surgery but my cyst is large, high up and pressing on my kidney. Doc says it will be a 4-8 day hospital stay. I’m hoping and praying it goes well with no setbacks. Then in a minimum of 2 -4 weeks I’ll start back to getting my chemo infusions. We won’t really know the results until a biopsy has been done, so that will tell how many more infusions are recommended and/or if I’ll be put into one of the trials for a chemo drug in pill form. This is the generous amount raised from our YouCaring site. We are no longer using this site because it was bought by GoFundMe.